This is the main hallway connecting all the other sections. It extends from the north end of the Temple Canton to the other, with doors to the outside on both ends. Near the entry doors on either end are hatches that lead down to the Hall Underworks, the sewers beneath the Temple Canton. A door on the east side leads to the Hall of Wisdom. The two doors on the southern end lead to the Ordinator Barracks, as do both the southern doors on the upper hallway. The northern door on the upper hallway leads to the Office of the Watch, and the two doors up the stairs to the north both lead to the Justice Offices. The non ordinator here is Melvure Rindu, who has a lot of general information, but nothing quest-related. These barracks provide sleeping quarters for the Ordinators. The four doors here all lead back to the Hall of Justice. 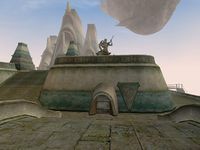 No one here is involved in any quests or provides any unique information, and aside from various pieces of Indoril Armor, there is nothing here of value to steal. All in all, there is very little reason to visit this location. This is the main office of the Ordinators. Both of the people here, Elam Andas and Tarer Braryn have relevance to miscellaneous quests. There is a sizeable collection of books in this office, but none of them are particularly rare or valuable. For some more interesting books, take a look at the trapdoor in the corner, half-hidden underneath the carpet. It is locked and trapped, and there is no key, but the two potential witnesses both have an Alarm value of 0, so ignore your attempts to break in. It leads down to the Hall of Justice Secret Library, which has a large selection of rare and interesting books for perusal. Several smaller offices are found in this location. 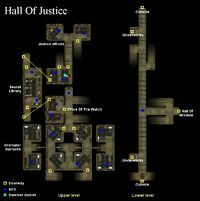 The two main doors lead back to the Hall of Justice, and there is another trapdoor under a carpet, also leading down to the Secret Library. This trapdoor has a 75pt lock, but there is a key, carried by Tholer Saryoni, who can be found in the High Fane. These offices also contain numerous books, but again, nothing rare or valuable. The only other item here of note is the Large Dwemer Goblet, found on the table in the same room with the trapdoor to the Library, which is of interest to the Thieves Guild. It belongs to Berel Sala, who is the head of the Ordinators. See Hall of Justice Secret Library.